Small businesses say that while Sa'ar has left issue of businesses staying open in Tel Aviv to his successor, there is no debate. 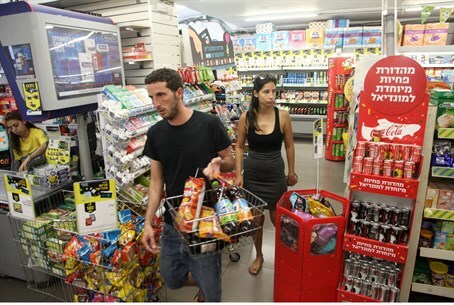 Outgoing Interior Minister Gideon Sa'ar (Likud) on Wednesday said his successor will decide whether supermarkets will be open on Shabbat in Tel Aviv, but the Headquarters for the Struggle of Small Businesses and Supermarkets in Tel Aviv says there's no room for debate. Sa'ar rejected the Tel Aviv Municipality plan to have stores open on Shabbat back in June, which led to an alternate plan submitted in mid-August, right around the time Sa'ar announced he was taking a break from politics. He refused to field the plan, warning that it is a weighty issue dealing with the fundamental values and laws of Israel. Responding to Sa'ar's decision, the Headqaurters said "the struggle we are leading is not a political struggle but an ethical one, against the blatant breach of (Israel's) work and rest laws, and against the warped reality causing improper competition and negation of the day of rest for workers." The Municipality initially went to the High Court on the issue, before deciding to submit its alternate plan. "Beyond its social responsibility, the High Court said things clearly (on the issue), and whoever sits as head of the Interior Ministry will have no choice but to choose to forbid retail commerce on Shabbat," added the Headquarters. Along with the Municipality plan, there is another threat on Shabbat in the form of a radical bill submitted by MKs Ruth Calderon (Yesh Atid) and Elazar Stern (Hatnua) early last month. The bill would allow local authorities to decide to let public institutions and municipalities stay open and desecrate the Shabbat, effectively removing such authority from the Interior Minister. According to the bill, local authorities would be able to decide whether cultural centers such as museums, theaters, restaurants and cafes could remain open in violation of the Shabbat.